"(Don't Fear) The Reaper" / "Tattoo Vampire"
"Debbie Denise" / "This Ain't the Summer of Love"
Agents of Fortune is the fourth studio album by American hard rock band Blue Öyster Cult, originally released by Columbia Records on May 21, 1976. The Platinum-selling album peaked at No. 29 on the U.S. Billboard chart, while the cryptic single "(Don't Fear) The Reaper" peaked at No. 7 in Cash Box magazine and at No. 12 on the Billboard Hot 100 singles chart, making it BÖC's biggest hit. The band became a bigger concert attraction after the release of the album, in part due to extensive airplay given to "(Don't Fear) The Reaper", to this day a staple of rock-station playlists. This is also the only album in the band's catalogue to have every original member perform lead vocals, and the only album to not feature any songwriting contributions from Eric Bloom. ^ Jurek, Thom. "Blue Öyster Cult - Agents of Fortune review". AllMusic. Rovi Corporation. Retrieved March 1, 2012. ^ Popoff, Martin (October 2003). The Collector's Guide to Heavy Metal: Volume 1: The Seventies. Burlington, Ontario, Canada: Collector's Guide Publishing. p. 54. ISBN 978-1894959025. ^ Tucker, Ken (July 15, 1976). 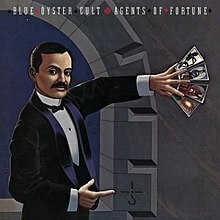 "Album Reviews: Blue Oyster Cult - Agents of Fortune". Rolling Stone. Archived from the original on October 12, 2009. Retrieved April 8, 2012. ^ a b "Agents of Fortune Billboard Albums". AllMusic. Rovi Corporation. Archived from the original on August 31, 2012. Retrieved March 2, 2012. ^ a b "Agents of Fortune Billboard Singles". AllMusic. Rovi Corporation. Archived from the original on August 31, 2012. Retrieved March 2, 2012. ^ a b "Blue Oyster Cult Official Charts". Official Charts Company. Retrieved April 5, 2016. ^ "Top Albums/CDs - Volume 23, No. 5, October 30, 1976". Library and Archives Canada. 30 October 1976. Archived from the original on 26 March 2016. Retrieved 2 March 2012. ^ "Blue Öyster Cult – Agents of Fortune (Album)". Swedishcharts.com. Media Control Charts. Retrieved March 2, 2012. ^ "Top Singles - Volume 26, No. 7, November 13, 1976". Library and Archives Canada. 13 November 1976. Archived from the original on 1 November 2014. Retrieved 2 March 2012. ^ "RIAA Searchable Database - search for Blue Oyster Cult". RIAA. Retrieved July 22, 2012. ^ "The 1976 Pazz & Jop Critics Poll". The Village Voice. Robert Christgau. Retrieved March 30, 2012. ^ a b "Blue Öyster Cult - Agents of Fortune". Acclaimed Music. Retrieved March 30, 2012. ^ "The Dave Marsh Lists". Book Of Rock Lists - Albums Of The Year: 1976. Rocklist.net. Retrieved March 30, 2012. ^ "Q Lists: Q Special Edition – The Greatest Classic Rock Albums Ever !". Q. Rocklist.net. Retrieved March 30, 2012. This page was last edited on 6 March 2019, at 05:49 (UTC).